Japanese knotweed (Polygonum cuspidatum) is a wonderful wild edible, but a horrible invasive species. It came originally from Asia, and has spread to the US from the UK as a planted ornamental plant for its pretty white flower sprays in summer and fall. 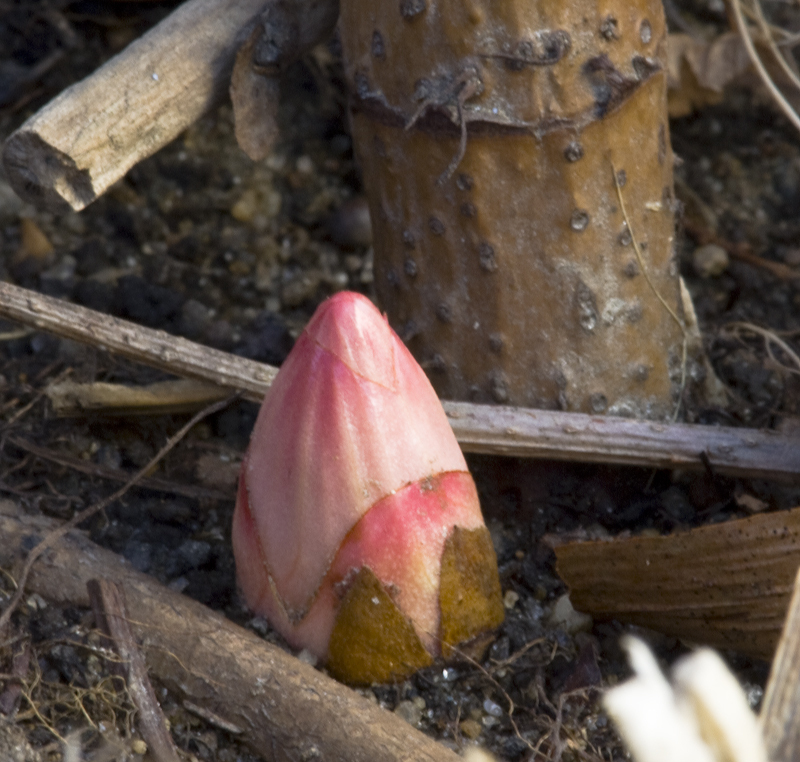 Japanese knotweed will grow just about anywhere, next to water, on the side of the road and railroad tracks, anywhere there is ample sunlight. It will also grow in just about any type of soil, so it easily excludes native vegetation. It spreads mainly through rhizomes underground, but the seeds have "wings" to better ride the winds. The rhizomes are strong enough to grow through asphalt and retaining walls, causing damage to structures. The thick layer of last season's decomposing dry stems will outmulch all competitors, creating large stands of impenetrable knotweed forests. 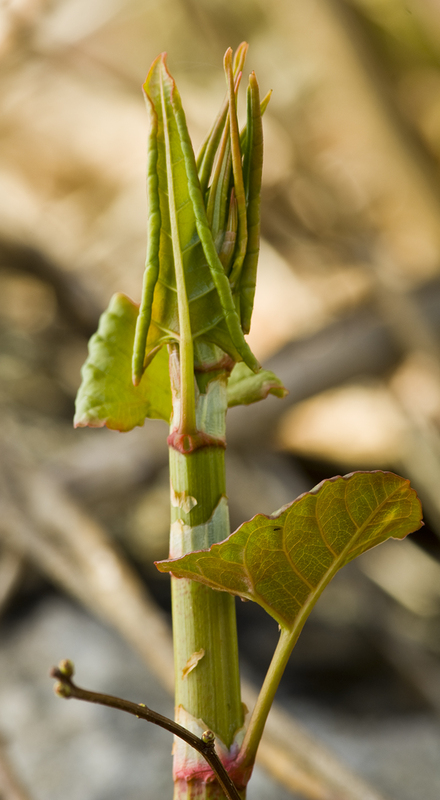 The shoots appear next to the last season's dry stems, first as pink shoots, then growing quickly into tall, red-speckled green stems with a crown of curled, green leaves. 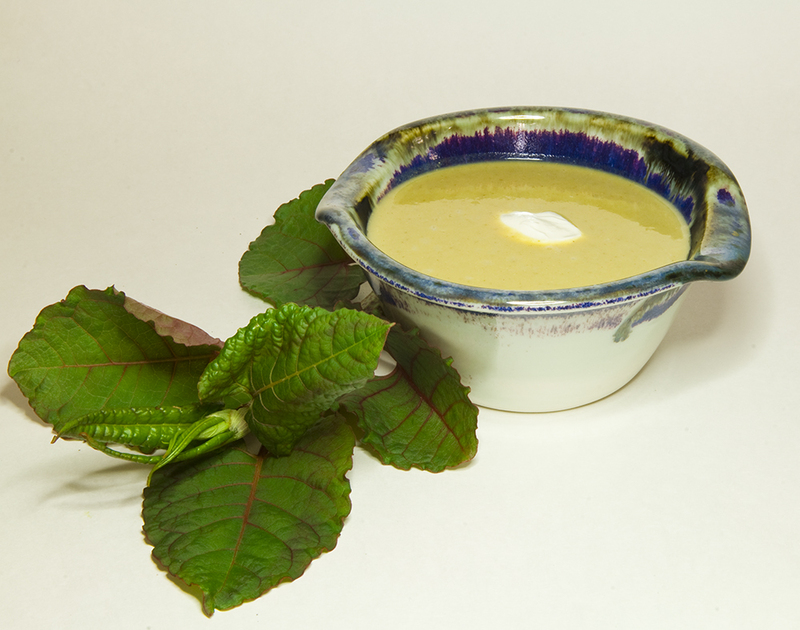 The shoots have a sour, green apple-like taste, but with an odd vegetal quality. It is probably one of those love-or-hate tastes. Some recipes may call for you to peel the stalks, which we do with a potato peeler. When the shoots are about 3"-8" tall is the best time to gather them to use in recipes like dessert bars, tapioca, or a jelly. If the stems are about 8"-12" tall, we still pick them to make the jelly or wine. 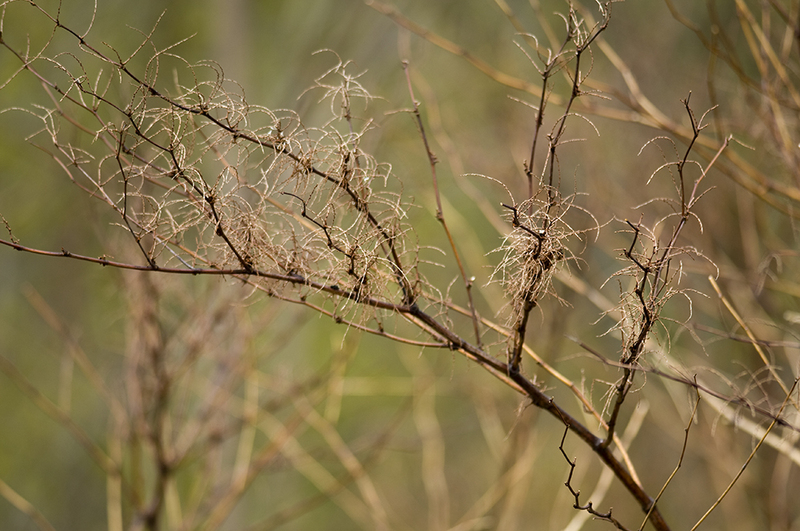 When they get too much taller, more leaves will unfurl and the stems become tough and stringy, almost more string than flesh. The stems can grow 6'-12' tall, and there is a second species that grows in our area that is even bigger, the giant knotweed (Polygonum sachalinense). There are several very distinct identifiers, including the jointed stem which looks like bamboo, a membranous sheath at each of the stem joints, and leaves that are broadly oval with an oddly straight base and a pointy tip. They unfurl into leaves about 5"-6" long and 2"-4" wide. When sliced, knotweed has a mucilaginous quality. 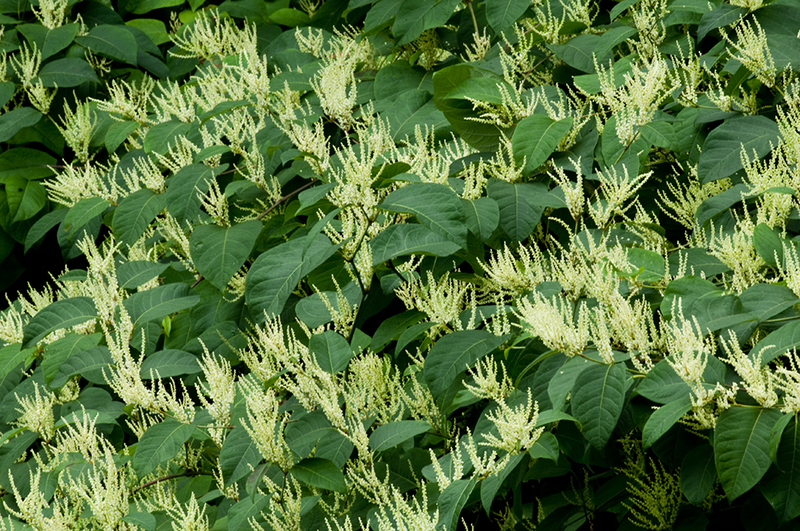 Japanese knotweed does contain some oxalic acid and should not be consumed in massive quantities. It also contains resveratrol, which is the same compound found in grapes and red wine that might positively affect heart disease. 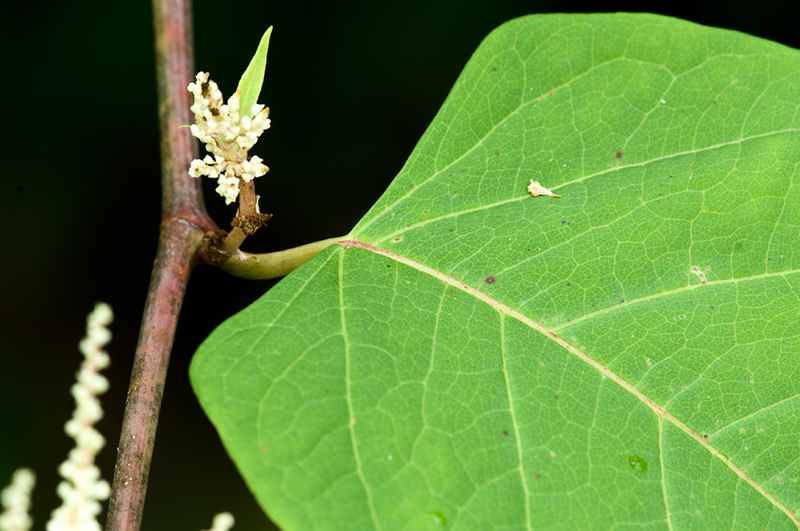 Most resveratrol nutritional supplements are derived from Japanese knotweed. I had no idea! I'm going to go forage some knotweed this week--it's everywhere! Can you dehydrate it? Thanks in advance! 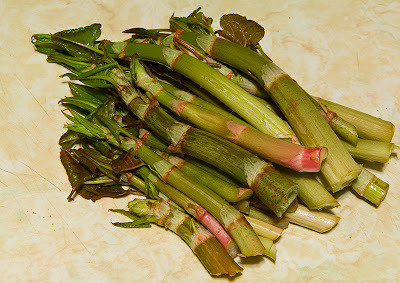 We have never tried to dehydrate the knotweed. I usually bake with it when fresh, and I have frozen some tender chopped pieces in the freezer with success. Making jelly and wine also worked well. Perhaps making a fruit leather from the puree might work? We might give the drying idea a go when the knotweed comes up. Fruit leather sounds like a great idea. Found some patches in a local park last fall when it was blooming. I keep checking back now. Should be any day!